Earlier in July, First Nations Development Institute (First Nations) – as part of its work to combat food insecurity, eliminate “food deserts” in Native American communities, and support economic and business development – released a new report that finds Native consumers in or near reservation communities generally have to spend more on food products than the national average, despite the fact that incomes are usually much lower in these communities while food access is, largely, much more difficult due to distance and transportation issues. 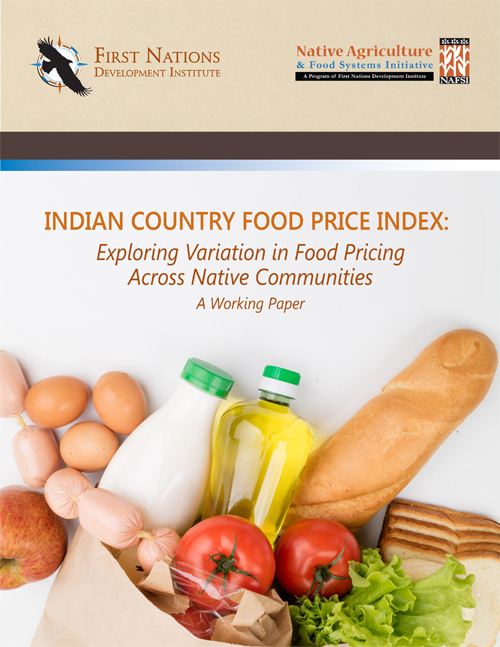 The report, titled Indian Country Food Price Index: Exploring Variation in Food Pricing Across Native Communities, is referred to as a working paper because First Nations plans to lengthen the time frame and broaden the scope of the price-sampling activities over the next year. Romero-Briones emphasized that the combination of higher-than-average food prices, lower-than-average incomes and persistently difficult access has created a “toxic stew of problems” for many Native Americans – nutritionally and financially. “Even a few extra cents or a few extra dollars spent on food can have a big effect on strapped Native families in many of these chronically impoverished communities, in addition to the negative health outcomes associated with a lack of nutritious, fresh and healthy foods,” she said. For the report, First Nations created a hypothetical basket of food commodities including milk, bread, eggs, apples, tomatoes, coffee, ground beef and even Cheetos®. Community partners collected monthly prices on goods and recorded them in an online database. These were then compared against the national average prices listed in the Consumer Price Index for Urban Consumers from the Bureau of Labor Statistics. Although generated from a small sample and during a short timeframe, the data highlight a few notable trends, including that food prices in Native communities, on average, are higher than in urban areas, and there is food-price volatility by month in Native communities. Native Americans in or near reservation communities who are interested in participating in the larger follow-up study are encouraged to watch for information soon about the “Call for Participants” or they can email info@firstnations.org using the subject line “Food Price Study.” Please include your full name, address, phone number, tribal affiliation, and a specific description of the town, area or region from which you might be able to report prices. Participants will be paid $50 per month over the expected 12-month duration of the project.